The amine selected, as well as the concentration of the solution used, will result in different selectivity of H2S over CO2, mole-to-mole acid gas loading, and degradation of the amine. Blended solutions incorporating more than one amine, as well as specialty designed amine molecules, can be used to increase selectivity, loading, and degradation characteristics of the final solution. Typical operating ranges for common amines have been given in Table 1. Acid gas loading values are based on carbon-steel equipment; higher loading may be achievable with stainless steel or CRA systems. Monoethanolamine (MEA), diethanolamine (DEA) and methyl diethanolamine (MDEA) are the most commonly used forms of amine in gas sweetening; although, diisopropanolamine (DIPA) and aminoethoxyethanol/diglycolamine (DGA) are also used. All are aqueous solutions of alkylamines that are used to selectively strip H2S and CO2 from an acid-gas rich hydrocarbon gas stream. MEA is commonly used in 15 – 20 weight % aqueous solutions. Due to corrosion issues, loading is limited to 0.30 – 0.35 moles acid gas per mole amine with carbon steel; loading as high as 0.70 – 0.90 mole/mole has been observed with stainless steel. Degradation products are extremely corrosive and should be removed via filters and reclaimer. Due to the high pH of MEA, all CO2 will essentially be removed in the process of stripping H2S to export specs. DEA, used in 25 – 35 weight % solutions, is also limited to 0.30 – 0.35 mole/mole loading in carbon steel, but can be loaded to 1 mole/mole when using stainless steel or corrosion inhibitors. Degradation products are less corrosive than MEA and reclamation is not practical due to the need for vacuum reclaimers. DEA has a lower affinity for CO2 and H2S and may not produce pipeline spec gas for some systems. Under low pressure and short residence time, DEA can be selective for H2S over CO2. DGA is usually used in 50 – 70 weight % solutions. Corrosion issues also prevent loading above 0.35 mole/mole. Preferentially selective for CO2 over H2S, but has a higher pH than MEA allowing it to reach pipeline specs unless gas stream has high CO2 content. Higher solution strength results in reduced circulation rates and lower freezing point. DGA is also able to absorb COS, CS2, SO2, and SO3. Generally, MDEA is used in 20 – 50 weight % solutions, but lower weight % solutions have been used in very low pressure systems. Loading ranges of 0.70 – 0.80 can be achieved due to significantly reduced corrosion issues. Oxygen exposure will produce corrosive acids and can result in build-up of iron sulfide. MDEA is also selective towards H2S over CO2, has a lower vapour pressure, has lower heats of reaction, and has higher resistance to degradation compared to other amines. Mixed amines are generally combinations of MDEA with DEA or MEA as up to 20% of the total amine. DEA or MEA are added to enhance the CO2 removal where MDEA alone allows too much CO2 to slip into the absorber or in low pressure systems where MDEA alone is unable to remove CO2 to pipeline specs. Filters can be used to remove solids & contaminants. An Inlet Separator may be used to remove hydrocarbons & water from the produced gas to reduce contaminants; an Outlet Separator may be used to remove any residual amine or solvent from the sweetened gas stream. A Flash Tank may be used to recapture hydrocarbons from the Rich amine. 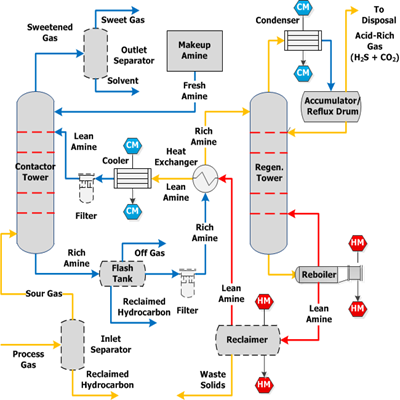 A Reclaimer unit is used for semi-continuous distillation with MEA solutions. DEA’s higher boiling temperature and lower degradation rate makes it less practical, less economical, and unnecessary to use a Reclaimer; filtration and caustic wash are sufficient purification for DEA. The Lean (acid-gas free) amine is circulated from top to bottom over plates or packing as the produced gas to be sweetened enters from the bottom of the Tower. By contact between the gas and the amine solution, acid gasses (CO2 & H2S) are stripped into the amine solution. The sweetened produced gas exits the top of the tower; Rich (acid-gas containing) amine stream exits the bottom of the tower. Rich amine passes through the Heat Exchanger and is pre-heated by the hot regenerated Lean amine from the Reboiler. An optional Flash Tank for the Rich amine and Filters can be used on the Rich (Inlet) and Lean (Outlet) amine streams. Like the Contactor Tower, the Regeneration Tower is also filled with plates or packing. Heated Rich amine is fed into the top while steam and vapor from the Reboiler enter from the bottom. Acid-gas-rich vapor exits the top of the Tower to the Condenser and Lean amine leaves the bottom of the Tower, entering the Reboiler for further acid-gas stripping. Heat is added at the Reboiler, generating steam and helping to break the chemical bonds between the amine and the acid gasses. The CO2 and H2S-rich vapor is sent into the bottom of the Tower, where the lower partial pressure of the rising steam helps liberate acid gasses from the falling amine. Optionally, the Lean amine may be sent to a Reclaimer to remove contaminants such as salts. The acid-gas rich vapour from the Regeneration Tower is passed through a Condenser to drop out water & any remaining amine, feeding into the Accumulator / Reflux Drum. The remaining acid-gas stream is sent for disposal; the water/amine solution is fed back into the top of the Regeneration Tower as reflux. Some amine and solvent are lost due to heating, refluxing, and wetting of the gas stream; additionally, the amine in the selected solutions break down or degrade over repeated cycles and fall out as solids. Periodically, fresh amine solution from a Makeup Tank will have to be added to the system with the Lean amine stream. A few key points should be considered before finalizing Amine System design and amine selection. Treated gas composition, including CO2, H2S, and other acid-gas contributors, must be understood to select the best amine for application. System pressures and re-circulation rates, as well as the use of stainless steel or a corrosion inhibitor, will impact amine selection, loading, and efficiency. Optional subsystems may improve performance and reduce degradation of the amine. For optimal operation and highest efficiency, all system components should be carefully selected.